After five years, Athens-Clarke County Library, GA was looking to migrate from their current sorting system to a new platform. The Library conducted a thorough evaluation and selected EnvisionWare as their automated materials handling (AMH) partner. The new 15-bin sorting system, developed by Lyngsoe Systems™, includes both internal and external drops, as well as a staff inlet to support the high volume of materials the Library circulates. The AMH system also includes new ergonomic features to streamline staff workflow and help to provide a more comfortable and safe work environment. This includes Lyngsoe’s Ergo Cart™ technology. The Ergo Carts automatically stack materials from the sorter onto the cart, making it easy for staff to simply transport the items directly to the shelf. The Carts also raise horizontally with the push of a button to make re-shelving easy and ergonomic for staff. EnvisionWare has put together a subscription package designed and priced to put computer and print management in reach for small communities. Stack of books, purse, shopping bag, DVD’s…there’s always a lot to juggle at the self-checkout station. 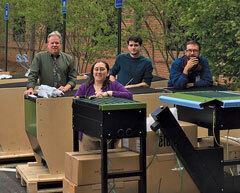 Fortunately, EnvisionWare’s new X11 Sidecars are there to lighten the load! “Treat others as you would want to be treated,” that’s a message that Jodi Bellinger has imparted to her two teenage boys, Ryan (16) and Shawn (13), and carries through in her role as EnvisionWare’s Director of Customer Support and Strategic Initiatives.